The Argentine presidential election on Oct. 25 did not answer the question of who will lead the country for the next four years. The vote tally eliminated only one of the three main candidates – Sergio Massa, the ambitious leader of the centrist Frente Renovador («Renewal Front») and former head of the cabinet of ministers. He had been unable to work with President Cristina Fernández de Kirchner and eventually announced his ideological break with «Kirchnerism», building an election campaign around his pointed criticism of her government’s economic policy. Mauricio Macri, the leader of the conservative Propuesta Republicana party («Republican Proposal»), has a good chance of winning the second round, which is scheduled for Nov. 22. He is one of the richest men in Argentina and came to politics after a successful career managing the Boca Juniors soccer club, bringing home well over a dozen titles and trophies. Eventually Macri decided that since he had been so successful in the complex world of soccer, he could score just as many winning goals in politics. Macri changed his appearance to give himself a more democratic image, no longer wearing expensive suits and ties. He shaved off his mustache and has also worked on his diction, hoping this will attract voters. His first major victory was in winning the mayor’s office in Buenos Aires (in 2007). He is a proponent of the neo-liberal economic model. Previously he made no secret of his intention to cut public spending and to discontinue Cristina Fernández de Kirchner’s «expensive» social programs. However, after being beset by a barrage of criticism, he stopped accusing the government of «wastefulness» in its attempts to address social issues, even resorting to populist rhetoric by vowing to eliminate poverty in the country. He also promises equal access to health care, free medicine for low-income seniors, the creation of over a million jobs, etc. Macri is opposed to the movement to integrate Latin America, as championed by Hugo Chávez, Kirchner, and Lula da Silva, favoring a stronger relationship with the United States and the EU and a greater distance from Russia and China. According to Macri, this would keep Argentina from irritating Washington by expressing solidarity with ALBA – the Bolivarian Alliance for the Peoples of Our America. Throughout the election campaign, the Argentine media, which is under the control of the Grupo Clarín media holding company, portrayed Macri as the popular favorite, while ignoring the platform of his main rival, Daniel Scioli, the candidate from the center-left Frente para la Victoria movement («Front for Victory»), which supports Cristina Fernández de Kirchner’s agenda. Scioli first won fame in sports, as a frequent world champion in powerboat racing. During a race in 1989, his boat overturned and Scioli lost his right arm. He won his first political office at age 40 when he was elected to serve as a deputy in the Argentine National Congress. He was a close ally of Nestor Kirchner, who took him on as his running mate during the 2003 election. Before becoming vice president, Scioli was governor of the Province of Buenos Aires. After Nestor Kirchner’s death in 2010, Scioli took the reins of the Partido Justicialista («Justicialist Party»), which was an important step toward strengthening his position at the national level. Scioli’s focus on winning the presidential election is evidenced by his freshly minted university diploma. Scioli had been forced to abandon his studies many years ago, but now – eager not to take a back seat to his competitors – he managed to pass his makeup exams at the Universidad Argentina de la Empresa (UADE) and defend his thesis, even as his campaign was in full swing. 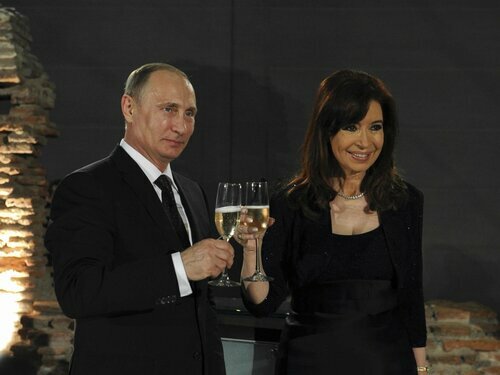 Scioli’s victory would ensure the fulfillment of the agreements between Russia and Argentina on their comprehensive strategic partnership, which were reached in April 2015 during Cristina Fernández de Kirchner’s visit to Moscow. On critical foreign-policy issues, Argentina habitually takes Russia’s interests into account. For example, in March 2014, Argentina abstained during the voting on the UN resolution condemning Russia for «events in Crimea». Russia in turn showed solidarity with Argentina in that country’s pursuit of a peaceful solution to the protracted conflict with Britain about ownership of the Malvinas Islands. 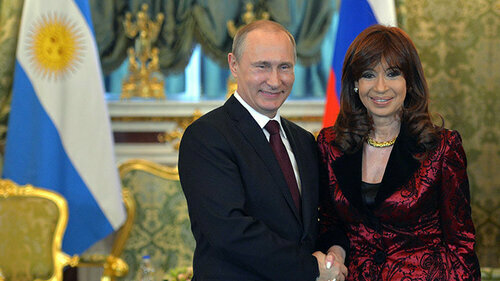 Cristina Fernández de Kirchner established a good personal relationship with Vladimir Putin. Their latest dialog, via video conference, was held on Oct. 21 at the height of the election campaign in Argentina. Christina endorsed the Russian president’s speech at the anniversary session of the UN General Assembly: «I want to congratulate you on your excellent speech at the UN, your speech was excellent, flawless, it probably [did] not quite fit within the framework of the commonly accepted rules of behavior that we have come to expect from [the leaders of] many countries, in which they say one thing and do another,» said the president of Argentina during their conversation. Argentine political analysts believe that even after leaving the highest political office, she will do everything possible to develop relations with Russia. They predict that – should he win – Scioli will continue to pursue that agenda, while at the same time taking steps to improve relations with the United States, in order to boost the influx of foreign capital into the country. His reasons are understandable. The statistical data published by the UN Economic Commission for Latin America and the Caribbean are quite alarming for Argentina. In 2014, total foreign investment decreased by $ 6.6 billion (over 40 %). Investors are cautious because of double taxation and restrictions on foreign-exchange transactions. Here we can also see the effects of Cristina Fernández de Kirchner’s «negative image,» which has been constructed over the course of many years by the subversive operations of US intelligence that are directed against Argentina. Particularly fierce attacks on the Argentine president appeared in July 2014 in Veja, a popular Brazilian news weekly that has long been a favorite tool of the CIA. On that occasion Cristina Fernández de Kirchner was accused of introducing a «Stalinist» dictatorship, misusing her television appearances, suppressing freedom of speech, introducing foreign-exchange restrictions on Argentines traveling abroad, and even of having psychiatric disorders («locuras»). At the same time, there were allegations that she wanted to rewrite Argentina’s history, in order to «falsify events and biographies of politicians». It was argued that Christina’s vigorous defense of Argentina’s rights to the Malvinas Islands during the dispute with the UK was a «symptom of illness». It should be noted that the US Embassy in Argentina has refrained from any overt intervention in the electoral process. Judging by revelations from WikiLeaks, the end of the twelve-year «era of Kirchnerism» is regarded by the State Department as a welcome chance to reprogram US-Argentine relations. Thus, the embassy would prefer to work with Macri, but the Americans have not written off Scioli’s chances either. Cristina Fernández de Kirchner’s successor will take office on Dec. 10 and will govern Argentina for four years. But Christina intends to remain active in politics. Moreover, she is not ruling out a shot at the 2019 presidential election. Her family members are also enjoying successful political careers. Her son Máximo was elected to represent Santa Cruz Province in parliament, and Alicia Kirchner, Cristina’s sister-in-law, won her fight to be that province’s governor. So «Kirchnerism» is not going away, it is merely regrouping.